Since I am perpetually behind all trends in popular culture, I am just now discovering that Vince Gilligan’s Breaking Bad is as purely addictive as the crystal meth his anti-hero Walter White cooks on the show. I’m also just discovering how Breaking Bad has so magnificently balanced its “entertaining” and “serious” elements, which is another way of saying – broadly – that it has succeeded as a narrative built on character and situation as well as a narrative based on plot. Before I get around to solving the problem of how I’m going to watch Season Six when I don’t have cable, let me throw a few semi-organized thoughts at you. All stories are driven by conflict. And to vastly over-simplify matters, these conflicts fall into two broad categories: interior conflicts, which tend to emphasize character, and exterior conflicts, which tend to emphasize plot. In its early seasons, Breaking Bad placed greater emphasis on internal conflict. Walt is a high school chemistry teacher driven to cook crystal meth because he fears he will die of lung cancer and leave his family penniless; and while the mechanics of working in the drug business are explored, more time is devoted to the conflicts Walt’s illness and the lies he tells to hid his business cause in his family, and then to conflicts Walt’s wife’s discovery of his profession cause in their marriage. This balance begins to shift in Season 3 as Walt’s involvement in the drug business deepens, and he is increasingly threatened by other criminals and by law enforcement agents. 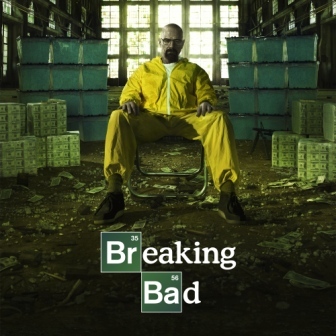 The latter half of season four delivers a rush of pure narrative delight as Walt scrambles to kill his former business partner, before he kills Walt and his family; and the story barrels into the shows of Season Five with Walt declaring he wants to build his own drug “empire”. It would be hard to over-praise Breaking Bad for how beautifully it manages its story, like a thoroughbred running the best race of its life, hitting all the beats, managing the minor cliffhangers of a commercial break and the larger cliffhangers of each episode’s conclusion. Add to this “the mob meets MacGyver” elements, as Walt applies his Mr. Science skills to eliminate one threat after another. And top it off with a question: how does Vince Gilligan make story lines that sound ridiculous when you describe them to your wife so convincing and affecting on screen? One answer is Bryan Cranston’s Walter White, who Vince Gilligan describes as a person who begins as Mr. Chips and who ends as Scarface, but who I think is much more interesting than Scarface. Walt doesn’t really want money, although he begins cooking meth as a way to pay his medical bills and provide money for his family after his death. What Walt really wants is agency and recognition. This becomes evident fairly early in the show, because Walt quickly makes enough money to take care of his family, but he is more concerned about his image as a nice but feckless and impoverished cancer-stricken dweeb than by the practical problem of how he is going to launder a half million dollars in cash. Walt craves success then, and even more importantly, the recognition and respect that come with success. This is one of the reasons he keeps getting lured back into the drug business, because only there is his success – as the well-paid maker of the world’s best crystal meth – recognized. It is also in this world that Walt’s intelligence and (as it turns out) decisiveness is acknowledged. He’s driven in part by desperation. He has to kill his business associates before they kill him. He has to elude the DEA. But the more often he wins, the more he likes it and the more he doesn’t stop to count the bodies that are piling up on route to his next victory. Only when his wife shows him the pile of money he’s amassed, literally as big as a Mini Cooper, that he retires – right at the end of season five. What was Walt chasing? What were all those deaths worth? This is a popular opinion and it’s true. Walt is a monster. The list of murders he’s committed prove it. So why are we on his side? Part of the answer is that Walt wants what most people want: to be self-sufficient and respected. Part is that we humans are social animals who chaff at the restraints our societies put on us even as we embrace them, and stories about criminals or seducers or other people who break the rules are a safe way to dream away our frustrations with society’s restraints. But a greater part of the answer is perhaps the loveliest fact in all narrative art. The social purpose of story and character, the moral purpose of literature – regardless of medium – is to teaches us empathy. Story asks us to inhabit the lives and experiences of the characters on which it turns its powers, and to understand them, even if we don’t like them – even if in the end we are right to condemn them. Macbeth, Milton’s Satan, Humbert Humbert, Walter White. It’s a great paradox of narrative art that rooting for bad guys can make us better people. But it can. At least when the bad guys are creations as brilliant as Walter White. Now I know much more about what you were telling me yesterday. Thanks. And thanks in particular for what you say about the empathy-teaching role of literature and drama. There is something very Macbeth like about Walt and his wife Skyler: haven’t quite shaped it into a complete thought yet. Walt is more active than Macbeth: he chooses his fate much more deliberately, I think. Skyler is less malignant. She gets dragged into the world of Walt’s crimes, but she’s a pretty willing participant in it, at least for a while. However, once Walt spills blood, he has to keep spilling it. Once he’s killed, he has to keep killing, or accept death. That is very much like the Scottish play. God I love this show, I like your review of it, very thoughtful. If you want to watch the new episodes (they are AWESOME) you can stream them for free. Thanks! So far, I’ve been reading the web summaries. I actually look for the ones that say “SPOILERS! SPOILERS! SPOILERS! Don’t read if you haven’t watched the episode … and if you haven’t, what’s wrong with you?” Maybe I’m very odd (yeah, okay, guess I am) but I’ve never minded knowing how a story ends at the beginning. I’ve always been most interested in how the story gets from A to Z. I actually watched Breaking Bad Season Five first. Then I watched each of the season finales. They I watched the full seasons in reverse order: four, then three, then two, then one. And I skipped a lot of the relationship scenes, even though they were also the most interesting parts of the story. Jesse and his mom and dad absolutely blew me away, because it was so interesting, and so difficult to watch, and because I have sons myself. By the by … I like your stuff. It’s snappy and incisive, and good. P.